Last summer the Eppley Institute for Parks and Public Lands at Indiana University’s School of Public Health conducted a survey on the Pumpkinvine Nature Trail to collect data on trail usage, health factors relating to trail usage and the economic impact the trail has on surrounding communities. The Pumpkinvine was one of eight trail systems in Indiana that participated in this study. Across all eight trails, there were some key findings. 52% of trail users were cyclists. In a similar 2001 study, the most popular activity was walking, so this is quite a shift. 67% of trail users report an improvement in their exercise level because of trail usage. Those who use the trail report spending more than $3500 annually on trailrelated expenses, such as bicycles, clothing, shoes, food, transportation, etc. Trail users say they enjoy better overall health, fewer sleep problems, less pain and less stress than non-users. • 66% of trail “neighbors” believe the trail has increased their property value. How did the Pumpkinvine Nature Trail compare to the seven other participating trail systems? In a lot of cases, the findings were very much in-line with the others, however there were some key differences. 72% of surveyed trail users are cyclists. This is a significantly higher number than the 52% that was reported statewide. The Pumpkinvine Nature Trail has fewer walkers. Only 16% of those surveyed are walkers, compared to 29% statewide. There are also fewer runners and joggers on the Pumpkinvine. 11.5% report that they run or jog, versus 19% statewide. There are slightly more birdwatchers on the Pumpkinvine, compared to the other trails. It’s interesting to note that Pumpkinvine cyclists were far ahead of the statewide average in the distance they cover when cycling. Pumpkinvine cyclists average 12.5 miles per ride, compared to 9.5 miles per ride statewide. They are also above average in the minutes per session, riding on average 84 minutes, compared to 72 minutes statewide. The only instance where Pumpkinvine cyclists were slightly below average was in how many days they ride, which is 3 days per week, compared to 3.5 days per week statewide. About half of all Pumpkinvine users drive to access the trail, which is a little higher than the state average. Additionally, Pumpkinvine users travel a greater distance to use the trail, compared to users of the other Indiana trails. 26% of Pumpkinvine users travel more than seven miles to access the trail, compared to 14.5% statewide. When you consider the potential that the trail has to draw tourists, this is very important information to have. While the majority of Pumpkinvine users are on the trail for physical activity, 21% of users say they use the trail for recreation. This was the highest average of any trail that was surveyed. Perhaps this is why people travel further to use the trail. You may have seen the recent articles in The Goshen News on how the Pumpkinvine Nature Trail helps boost the local economy. According to this study, it’s true. On average, Pumpkinvine users report spending more than $3000 per year on trail-related expenditures, such as bikes, clothing, food – and transportation to get to the trail (gas, etc). This coincides with the long distances people travel to use the trail. The information above is a broad summary of the Eppley report. 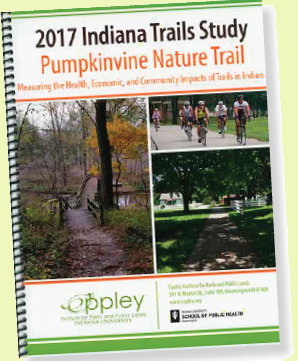 To view the full trail study summary report for the Pumpkinvine Nature Trail, visit https://eppley.org/wp-content/uploads/2018/06/TrailsStudy_PumpkinvineNTReport.pdf.